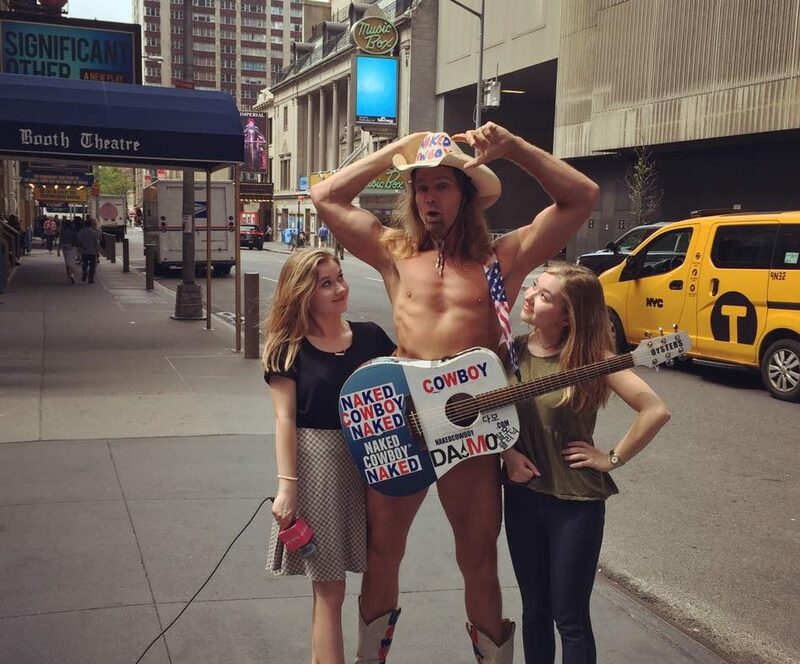 Speaking to The Naked Cowboy’s manager by phone, in preparation for an interview with the iconic New York City tourist attraction, we are told to meet in Times Square right at our scheduled time – two o’clock on the dot. The Naked Cowboy is very punctual, we are warned. Arriving ten minutes early, the two of us stroll into the VIACOM parking garage and wait. Sure enough, five minutes later, a flash of red, white and blue appears in our peripheral vision and begins to descend the ramp. It is Robert John Burck, the man behind the legendary act – clad in only briefs, cowboy boots, and a guitar. He calls out to us. Burke tells us he’ll be back in four minutes, ready to begin right at two. When we reconvene, Hannah and I tell Burck to follow us. The three of us move down the street as we search for the best place to shoot our interview. People begin to crowd around immediately; cameras flash. We watch as Burck greets tourists as if they are old friends. He looks right at home. Hannah and I turn our backs for less than a minute to grab a camera, preparing to take a photo of The Naked Cowboy and a pair of tourists, and return to an excitable Robert, stepping toward us with an expression of bewilderment. “Did you hear what that couple just told me?” he asks. We tell him that we missed it. All in a single breath, he gushes a recount of a personal story that the two had just approached him to share. He seems to remember every detail. “I hear great stories every day,” he says, still in awe. Stories, similar to the ones we know Burck himself has. Eager to learn the backstory of the famous New Yorker, we begin the interview. Our first moment of enlightenment comes when Burck describes himself as an avid reader who finds inspiration from greats such as Emerson and Nietzsche, often for several hours a day. Not surprisingly, he answers each question with the confidence and enthusiasm of the kind of person who runs around New York in his underwear on the daily. By the end of our conversation, we feel like we “get” Burck – and there’s a whole lot more to The Naked Cowboy than what we ever could have inferred just from passing him on the streets. As we head down the street after the interview, approaching the heart of Times Square, Burck tells us that his wife, Patricia, and her two sisters are also in the city, likely performing nearby as the Naked Cowgirls. Surprised, I tell him that it now makes sense that he says he’s never been criticized by his family – they are in on it, too. “That’s why they are okay with it,” I joke. Now about a foot ahead of Hannah and me as he makes a beeline to the space he claims as his stage, Burck doesn’t miss a beat.